In an attempt to show off the new Range Rover Sport PHEV's true capability, Land Rover has taken on one of the world's most challenging roads. It's an absolutely insane feat, and the video of the climb looks absolutely breath taking. The challenge began at the bottom of the legendary 11.3km Tianmen Mountain Road (known as the Dragon Road). What's really impressive is that the climb that the Range Rover Sport P400e is not modified in anyway - it's straight from a showroom. Panasonic Jaguar Racing’s Ho-Pin Tung was behind the wheel and the Terrain Response 2 system in Dynamic mode. 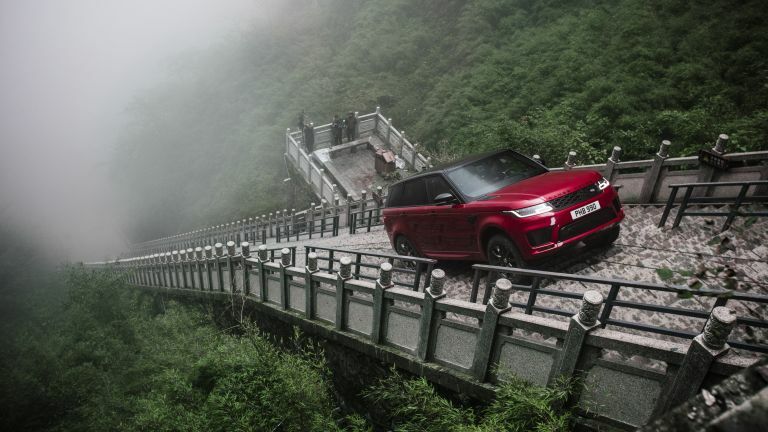 The new PHEV powertrain gives the Range Rover Sport a zero-emission EV range of up to 50km when fully charged, but Ho-Pin Tung used its advanced 300PS Ingenium petrol engine and 116PS electric motor to make short work of the road section of the challenge. The sporty SUV then showed its all-terrain credentials by climbing the steep staircase. The driver, Ho-Pin Tung said, “I’ve experienced Formula E, Formula 1, and won at the 24 Hours of Le Mans, but this was without doubt one of the most demanding driving challenges I’ve ever faced. Head over to Land Rover's YouTube channel for some Behind the Scenes videos.